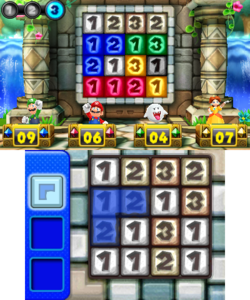 Grid is Good (known as Points Pile-Up in PAL and NOE releases) is a General minigame from Mario Party: Island Tour. The name is a pun on the saying "Greed is good". The player takes a shape from the box on the left and places it on the grid. The top screen shows the space the player claimed it being highlighted, and another player's shape is shown on the board taking away one of the first player's claimed squares. The number of points are awarded to the two players. The board changes, the players nod, and the game begins. Players use the shapes in the left box and put them on the board. After 10 seconds, the shapes where the players placed them are revealed. The numbers that were claimed by two or more players are burned out, and the players are awarded points based on the numbers on the spaces only they claimed. The player that has the most points at the end of three rounds wins. Rules – NA "Place one of your shapes on the board to claim a set of numbers. You'll win points for the numbers you claimed that weren't also claimed by your opponents." Rules – PAL "Place a panel over the numbers to win points. You'll only get the points if your rivals didn't also try to claim the same numbers you did!" Paneru o kasaneru na! Panel Pile-Up! This page was last edited on May 20, 2018, at 17:47.